imrod, a mighty hunter before the LORD." Few words in the Bible have excited so much interest or speculation as the brief passage in the Table of Nations of Genesis 10 that describes a mysterious character known only as "Nimrod". Many have speculated on the true identity of this king, trying to match him up with numerous Assyrian, Babylonian, and even Egyptian kings. To this date, however, his true identity remains a mystery. Nimrod, besides being a mighty hunter, was also known as both a conqueror and a builder of cities in the world after the Great Flood, in the eastern part of the region formerly known as Osiria, now generally known as the ancient Near East. All over the ancient Near East — and perhaps throughout the entire world — legends state that Nimrod went far and wide conquering, and to conquer the barbarians that surroundedancient Mesopotamia (modern Iraq) on all sides, and building various cities in order to bring civilization to the face of the Earth. Thus, like Osiris of the Egyptian legends, he was the great civilizer of mankind, raising the standards of living for all under his domain (map). Yet, despite the positive aspects of his rule, the myths and legends that have circulated ever since about this mysterious king tell the tale of a man who also was possessed of a dark side. To be free of God's rule was his dark obsession, and in order to accomplish his dark purpose, he spoke dark sentences to enslave mankind to the ring of his dark will. 8Cush was the father of Nimrod, who grew to be a mighty warrior on the earth. 9He was a mighty hunter before the LORD; that is why it is said, "Like Nimrod, a mighty hunter before the LORD." 10The first centers of his kingdom were Babylon, Erech, Akkad and Calneh, in Shinar. 12and Resen, which is between Nineveh and Calah; that is the great city. This passage, though seemingly short, is in fact surprisingly long in context, being given an unusually large treatment in the otherwise extremely concise listing of the descendants of Noah. This has led many to believe that this man was considered to be truly exceptional not only in his time, but for many thousands of years afterwards, to the point where his ascent to power may have been a paradigmatic event of such magnitude that it had altered the course of human history forever. Moreover, some believe that one like Nimrod may rise again at the time of the end in a final attempt to conquer the world, so the identification of this mysterious character of the past may be critical to understanding our future and, possibly, our present. An Assyrian relief depicting a warrior engaged in battle. Mesopotamian kings were considered to be at least partly divine, and had to prove themselves in battle either with a powerful opponent, or with a powerful wild animal, such as a lion. This tradition likely had its roots in the traditions of kingship of Mesopotamia that had been laid down by the mysterious Nimrod thousands of years previously. Scholars have long debated on this issue, particularly as to Nimrod's ancestry. King Nimrod ruled over the land of Mesopotamia, which was inhabited primarily by Semites, whereas the rest of Ham's offspring, including Cush, lived in Canaan, Egypt, North Africa and what is now southern Saudi Arabia. Perhaps instructive to this point is the etymology of his name. "Nimrod", many believe, has the root of the Hebrew word marad, "to make rebellion", which has led most scholars to agree with most of the myths and legends surrounding Nimrod that he was indeed the first to renew the rebellion against God in the world after the Flood. Part of this rebellion may have been his refusal to dwell in the lands alotted to the descendants of Ham, instead setting up his own kingdom apart from the authority of God, in a place of hischoosing. Ignoring God's prime directive to "Be fruitful and increase in number; fill the earth and subdue it." (Gen. 1:28) — to spread over the entire face of the Earth — Nimrod instead centralized power in Mesopotamia in a bid for world supremacy, in an attempt to rule over mankind in God's stead as a self-appointed steward. Along these lines, an interesting Sumerian text was discovered in the last century called The Sumerian King List. In this ancient text, there is a description not only of the early kings of Mesopotamia (all of the kings of Sumer and Akkad previous toSargon), but also a list of the kings from before the Flood. Most importantly, this text describes how kingship had been "lowered from heaven", both before the Flood, and afterwards. Kingship had come deux ex machina not once, but twice. Like the biblical authors, who stated that "There were giants in the earth in those days; and also after that" (Gen. 6:4), the ancient Mesopotamians also recognized that the same deities who had brought civilization to the world before the Flood had brought it once again tothe world after the Flood, starting in Mesopotamia, in the city of Kish.1 This "Kish", and not the "Kush" listed as the forebear of Nimrod, may have been the true point of origin for Nimrod. 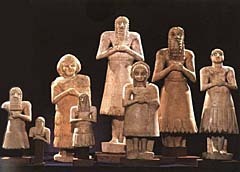 Sumerian votive statues of the Early Dynastic period (ca. 2800-2400 B.C.) These statues were left by worshipers at the altars of their gods to pray on their behalf even when they were not physically present. Click here to view similar lost treasures from the Iraq Museum courtesy of the University of Chicago'sOriental Institute, or go directly to the Iraq Museum International website. Moreover, as we saw in Part I of "Giants in the Earth", one of the results of the descent of "kingship from heaven" — the fallen angels coming down to Earth and setting up kingdoms of their own apart from God's direct control — was the manipulation of the human genomein order to to create a race of giants that would conquer and exterminate God's own creation, homo sapiens. This race of giants, the Nephilim, was accompanied by a mixed-breed of giants and normal homo sapiensknown as the Gibborim, or "mighty men", who were exceptionally tall, strong and warlike. This term,gibborim, "mighty men", is the same term used to describe Nimrod — "Nimrod, who grew to be a gibborupon the Earth". Based on this, most commentators believe that Nimrod was in fact a giant, the first and most powerful of the new race of giants that the fallen angels were recreating in the world after the Flood. Thus, the text of Genesis 10:8 may be amended to read: "Nimrod, who was the first of a new breed of giants on Earth, came from Kish." And even though that emendation does answer some questions, it does not necessarily indicate an error in the textus receptus. The city of Kish could be eponymous, named after Kush, their ancestor. An Assyrian relief depicting a king finishing off a wounded lion. Depictions of kings in battle with lions are particularly common in Mesopotamian art, and were designed to enhance the king's image as a powerful and virile conqueror. 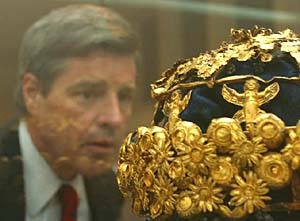 U.S. Embassador to Iraq Paul Bremer gazes in awe upon a golden crown that had once been worn by ancient Babylonian royalty. The crown, along with numerous other irreplaceable treasures, had been recovered from looters and restored to its place in the Iraq International Museum. Click here to view a comprehensive slideshow of the recovery, and of Bremer's visit to view the priceless artifacts. Nimrod began his campaigns of conquest from his base in Mesopotamia, where he had apparently first begun his quest to uncover the world from before the Flood. Though the locations of Babylon amd Erech (Uruk, modern Warka) are both well known, having been rediscovered over a century ago, Akkad, though well attested in ancient literature, has yet to be found. Shinar and Calneh are even more difficult to identify, having no clear cognates either in archaeology or ancient literature. If Nimrod was indeed a mighty conqueror, it may even be that the term "all of them in Shinar" may not refer just to the preceding three cities, but to all of the cities in Sumer, of which Babylon, Uruk and Akkad were preeminent. As such, Genesis 10:10 may be better translated as "His conquests began with Babylon, Uruk and Akkad, and then all of Sumer", a translation which fits perfectly with the description of Nimrod as a mighty warrior and hunter in the preceding verses — Nimrod was the first would-be dictator. Commentators typically hold that Nimrod did not build the major cities of Sumer, but simply ruled over them, his major building activity being exclusive to Assyria, as described in verses 11-12. As we have seen, Babylon, Uruk and Akkad were likely the ruined remnants of cities from before the Flood that Nimrod had reoccupied and rebuilt, which is probably why he is not credited with founding them. As such, though we will probably not be able to determine when these cities were first built, if we can determine when they were rebuilt, it may help us in our search for the true identity of the mysterious Nimrod. The "Standard of Ur," with lapis, shell and limestone inlays, 8" x 19", Ca. 2650 B.C. The top panel shows soldiers leading prisoners of war to their king. Foot soldiers and charioteers make up the next two panels. In the fourth panel, the king is seated at the left while servants wait upon him and his banqueting guests. A harpist and singer at the right provide entertainment. The last two panels depict commoners in procession to the court. They bring livestock and the fruits of the land and sea as gifts for their royal master. This "standard" provides a good general representation of life in Ur in the mid-third millennium b.c. For this and more art of the ancient world, check out The Metropolitan Museum of Art's Art of the First Cities exhibit. The first known culture in Sumer was the "The Uruk Culture", which rose around 3500 b.c. The Sumerians, who are believed to have emigrated to southern Mesopotamia from India and parts further east around 4000 b.c., had assimilated and intermarried with the native Semitic (Akkadian) populations who lived in the north of Mesopotamia to the point where, around 3500, b.c., the two groups were no longer clearly distinguishable. This mixed Sumerian/Akkadian population would form the cultural and ethnic basis for Mesopotamia for millennia afterwards, the kings of the region, starting with Sargon, routinely referring to themselves as "king of Sumer and Akkad". However, though the culture is referred to as the "Uruk Culture", Kish was most likely the first of the cities to be resettled by Nimrod's people, as it is there that the Sumerian King List says that kingship was again brought down from heaven. Moreover, the first known writing comes from the city of Kish around 3500 b.c., which is important as the skill of writing was one of the gifts the fallen angels had given mankind that had led to their destruction by the Flood.8 Finally, the Bible also describes "Kush" or "Kish" as the "origin" of Nimrod. Thus, as Kish is described in the Sumerian King List as the place where kingship had come down from heaven again after the Flood, where writing first originated, and where the Bible places the origin of Nimrod, Kish ca. 3500 b.c. is the most likely setting for the rise of the mysterious Nimrod. Economic documents that date to around 3200 b.c. show that Uruk rose in power as a rival to Kish, however, and indeed the Sumerian King List clearly states that though Kish was indeed where kingship had come down from heaven, that city was later abandoned first in favor of the city of Uruk and, still later, to Ur. Clearly, there have been many potential Nimrods in the history of Mesopotamia, so we will need to analyze the biblical and related data further in order to narrow down the list and find the true Nimrod. The Bible mentions that the beginning of Nimrod's kingdom was Babylon, Uruk, and Akkad, information which provides parameters of time that may help us determine the true identity of Nimrod. Akkad, for example, is believed to have been built by Sargon I ("the Great") who reigned between 2371–2316. If Akkad indeed did not exist before that time, then Nimrod could only be Sargon, or some later king. However, the Akkadians as an ethnic entity existed as far back as 3500 b.c., so the city of Akkad was more likely rebuilt by Sargon, rather than founded. The time in which Babylon was founded is unknown, but it was in existence during the time of Sargon as well. We know this as Sargon's daughter, Enheduanna, priestess of the moon god in Ur, had written songs in praise of the temples ofBabylonia during the time of Sargon, ca. 2350 b.c. Uruk, of course, was in existence at least as early as 3500 b.c., so we can date Nimrod back at least as far back as that time as well. 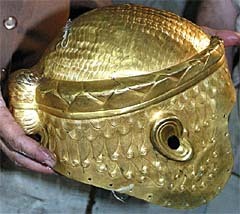 "The Golden Helmet of King Mes-Kalam-Dug". Some date this helmet to 2450 b.c., but others, such as Wooley, date it back as far as 3500 b.c. This was one of the irreplaceable treasures that had been recovered from looters and restored to its place in the Iraq International Museum. Click here to view a comprehensive slideshow of the recovery. Unfortunately, though it has uncovered some interesting information, our analysis of verse 10 has not added any information that narrows the field of inquiry into the true identity of Nimrod. Fortunately, verses 11-12 supply more information. After he had conquered and consolidated Sumer, Nimrod then turned his eyes northward to Akkad. Though it is not explicity stated, in order to have the ability to construct cities in Akkad (laterAssyria), Nimrod would have to have conquered that region first. Therefore, Nimrod did not simply travel to the region as a benevolent architect — he came as a conquering king, taking over and becoming absolute dictator of both Sumer and Akkad. Having conquered and controlled all of Sumer and Akkad, Nimrod then embarked upon an ambitious building program. Not satisfied with merely rebuilding the past, he wanted to determine the future, and make a name for himself in the process. Perhaps that is why Moses did not give his true name, and left his fame purposely obscure — by naming him by name, and giving a more thorough explanation of his feats, Moses would have aided this wicked would-be dictator in his goal of making his name last forever in history. Unfortunately, the material in verses 11-12 is as obscure as those in verse 10, if not more so. Not only are some of the place names obscure, it is debatable whether or not Nimrod is even being spoken of in these verses. Some believe that the verb yatsa, "to go forth", is actually the name of "Assur", one of the sons of Shem, which is why the KJV differs here. This makes some sense, as the Assyrians were indeed the descendants of Asshur. However, in context, it is clear that Nimrod is implied, particularly since the Nimrod passage is inserted into the list of the descendants of Ham, and not the list of the descendants of Shem. After he had conquered and consolidated Akkad with Sumer, Nimrod embarked upon an ambitious building program. The cities he built are typically enumerated as "Nineveh", "Rehoboth Ir", "Calah" and "Resen". The Masqah Gate of Nineveh. Formerly Assyria, Nineveh is now located in northern Iraq. Nineveh once a vast, sprawling center of commerce that extended for miles and encompassed several cities. Nineveh is easily identified, having been one of the greatest cities of the ancient world. Nineveh had been settled as early as 6000 b.c., and had been continuously inhabited as late as the 16th century. Rehoboth-Ir is most likely meant to be used adjectivally, describing how very large, wide and open Nineveh was. Nineveh was indeed a huge, cosmopolitan city and a major center of commerce and industry for the region. One gets the idea from this and other passages in the Bible — such as the description in Jonah that Nineveh was so huge, that it took three days to pass through the city (Jonah 3:3) — that Nineveh was an extremely spread-out, "open" area which was packed full of traders, merchants and businessmen from all over the world. So the addition of the adjective "Rehoboth-Ir" is totally appropriate, as Nineveh was indeed an exceptional city of the ancient world. Calah is to be identified with the Assyrian city of Kalhu, or modern Nimrud.11 Calah/Nimrud is located just a few miles southeast of Nineveh, and was likely part of a larger trading region centered at Nineveh. The meaning of the name is obscure, but it may have been meant to be the Akkadian/Assyrian equivalent of Babylon in the north, as the name can also be translated as "Holy Gate" or "Gateway of God": "The name of one of the great cities of Nimrod.... The meaning of the name is unknown, but if a Sumerian etymology be accepted, some such signification as "Holy Gate" (Ka-lah) or the like — a parallel to Ka-dingira = Bab-ili, "Gate of God" — might be regarded as possible".12 Calah may have been Nimrod's attempt to create his own Babylon in the north, to equate himself with the giants of the antediluvian world who had created Babylon. Resen is another difficult city to locate. Some have suggested that there was a misspelling in the Hebrew text, where the Hebrew letter "d" was replaced by the very similar Hebrew letter "r", turning "Desen" into "Resen" As such, commentators have suggested that it refers to "Dur-Sharrukin, the administrative city founded by Sargon II, halfway between Nineveh and Kalhu to the north. "13 Another possibility is Res-eni, "fountainhead." "The only town so named in the inscriptions is one of 18 mentioned by Sennacherib in the Bavian inscription as places from which he dug canals connecting with the river Khosr — in fact, it was one of the sources of Nineveh's water supply. It probably lay too far North, however, to be the city here intended. "14 These explanations are weak, and solutions can be found without amending the text. The best explanation is probably the ruins at Selamiyeh, once known as "Larissa". Resen also was once a substantial city, the third of a triad of cities that made up the larger trading network composed of Niveveh, Calah and Resen. All together, the three cities that Nimrod built in Akkad/Assyria appear to have formed a vast trading area, a "greater Nineveh", which no doubt was the center of trade of the ancient world. Moreover, their construction may have been meant to mirror the three major cities of Sumer, Babylon, Uruk and Akkad, that Nimrod had inherited from his spiritual ancestors, the giants from the world before the Flood. Nimrod, attempting to recreate that lost world, spared no expense in the attempt, motivated by pride to make a name for himself that would live forever. Though he has long since passed from the world stage, his great city of Nineveh outlasted Akkad and even Assyria, being inhabited well into the Moslem period and almost into modern times. Moreover, with the freeing of Iraq, the ancient lands of Sumer and Akkad are free once more to become great centers of commerce. Interestingly, our translation of Genesis 10:11-12, where Nineveh and its surrounds are seen as forming "the great city", may be a clue to a similar role for this region in the end-times. 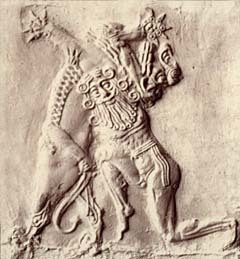 "Izdubar Strangling a Lion." Izdubar, or "Gilgamesh", was the archetypal divine king, one of the first kings of Sumer, ca. 3500 b.c., Gilgamesh claimed to be "two-thirds divine", a demigod whose lineage was mostly divine, and he was also considered to be a giant, as is shown in this sculpture. Also an archetype of the later Heracles/Hercules of Greek myth, Izdubar/Gilgamesh is the most likely source of the Nimrod legend though others, such as Sargon, and even some deities, are close contenders. Interestingly, the approximate height of the figure in this sculpture is a giant at close to twenty feet, based on the relative size of the lion. Image from The Chaldean Account of Genesis. Nimrod was the first to do many things, including hunting, eating meat, and making war, and was generally portrayed as the originator of everything in society that goes against God's will for mankind. Yet, according to the traditions, he was not always that way. We have heard about how Nimrod encouraged men to rebel against God, but now we understand why — so that Nimrod could rule over mankind in the place of God. Nimrod's encouragement of man to rebel against God was not in their best interests, only in his own. Putting himself in the place of God, he made an idol out of himself, cursing God and disobeying his laws, even those that had God had given to his ancestors. Coveting the land of Shinar, he stole it from those to whom it had been given, and murdered those who opposed him. He then taught men to do the same, to abandon marriage in favor of adultery, and lying in favor of truth, so as to maximize their ability to pursue personal power and glory. He then spoke out against God and his divine laws, giving his subjects unbridled freedom and the ability to pursue happiness and self satisfaction. Afterwards, after this philosophy had — predictably — led to anarchy, Nimrod then enslaved the morally weakened and divided peoples, replacing the fear of God with the fear of himself. This "divide and conquer" approach was to be the hallmark of his rule and that of his descendants from that time onward, even unto the time of the end. A depiction of the ancient Sumerian creation epic, wherein the creation of the heavens and the earth was viewed as the result of a battle between the high god of the Sumerian pantheon (originally Anu, then Enlil, later Ninurta, Marduk, Asshur) and a dragon named "Tiamat". This depiction appears to a later version where the god Marduk was credited as the defeater of the dragon and creator of the heavens and Earth. Marduk, a mighty warrior god, may have been the prototype for the biblical Nimrod. Most commentators assume that Nimrod was a man — a long-lived, superior physical specimen of a man, gigantic in stature and in personal charisma. One possibility that most commentators overlook, however, is that Nimrod may not have been a man, but a deity. The ancient Mesopotamians tended to idolize figures who were powerful hunters, warriors, and leaders, and as such, their gods tended to reflect these attributes. Moreover, the long span of time indicated by the accomplishments of Nimrod in the Bible leads some to suggest that, since most human kings reigned for less than 50 years, 60 at most, either Nimrod had a supernatural longevity, was a particularly successful politician, or the biblical writers may have had one of the false gods of Babylon in view. "If Nimrod is not a god, he must at least have enjoyed a divine longevity. "20 And though there are candidates on the list that fit either of the other two criteria — unusual longevity and political prowess — the Babylonian Deity theory has its merits. And of these gods, two have stood out in the history of Mesopotamia as "mighty hunters" and "builders of cities": Ninurta, and Marduk. Marduk, god of Babylon, and one possible contender for the mysterious Nimrod. The character of Nimrod, then, may not have been a man at all, but a Babylonian deity who was considered to have been present at the foundations of all of the cities in both Sumer and Akkad. 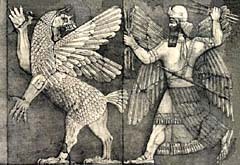 Both seen as mighty warriors and civilizers, Ninurta, Marduk and other lesser Mesopotamian deities may represent a tradition that was unique to Mesopotamian history. And since no one king or even one god ever ruled for the whole of Mesopotamian history, Moses may have decided to give this "king" the generic name of "Nimrod", just as he done with the term balal, "confusion" used to describe the Tower of Babel in Genesis 11. In this way, he also avoided mentioning the name of a foreign god in the text, which would have broken the first commandment. 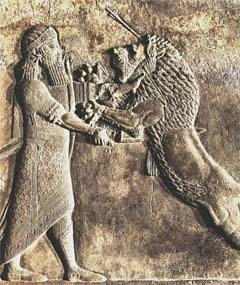 Izdubar (Nimrod) in Conflict with a Lion. Izdubar is generally considered to be the same character as Gilgamesh, a mighty hero/king of Sumer ca. 3500 b.c. who had been known for his feats of strength and defeat of numerous dangerous creatures. Deified after his death, Gilgamesh was a major figure in Mesopotamian myth and legend for millennia. Though Ninurta and Marduk are good candidates for the mysterious Nimrod, by far the best candidate is the ancient hero/king Izdubar, more commonly known as "Gilgamesh". Gilgamesh was the king of Uruk, the biblical "Erech", and was believed to have been given the secret knowledge of the world before the Flood by the gods. As we have seen, according to The Sumerian King List, after the Flood kingship had been lowered from heaven once more, in the city of Kish, in ancient Sumer. According to the list, since kingship had been lowered from heaven to Kish after the Flood, "Twenty-three kings ruled it for 24,510 years, 3 months and 3-1/2 days".24 After that period of time, which is probably inaccurate, Kish was defeated in battle, and the kingship of Sumer had been moved to the city of Uruk. There, Gilgamesh was the fifth king in a line of 12 kings that lasted for 2,310 years until Uruk had been defeated in battle and the kingship removed to the city of Ur. he brought information of the time before the Flood. Take hold of the threshold stone — it dates from ancient times! three leagues and the open area of Uruk it (the wall) encloses. As we have seen, at least one scholar has translated the ancient symbols that make up the name "Izdubar" to read "Namr Ud", "Shining Light". Smith also points out that Izdubar was also specially connected to the town of "Marda", the original Akkadian name of which was "Amarda". In Akkadian, the word for "god" is "an", and put together with "Amarda", it becomes "Anamarda", which is very similar to the name "Nimrod" ('Ni-mar-a-da). Moses would not have wanted to give Gilgamesh fame in the Bible, though, even though he was only a demigod, placing his name in the Bible also would have violated the first commandment. Therefore, it is likely that Moses substituted "Gilgamesh" with "Nimrod" — a generic term meaning either "shining light", "he from Marad", or perhaps another translation that as yet eludes us. Thus, Izdubar/Gilgamesh fits the description of Nimrod both in name and in fame. However, though Gilgamesh did rule Uruk, one the cities mentioned in the Bible as part of Nimrod's kingdom, he was not known for being a conqueror, merely an adventurer and a seeker of mysteries. Moreover, there is no mention in the myths of Gilgamesh having built the cities of Nineveh, Resen, and Calah, which Nimrod had been credited with. These cities were reserved for our next candidate: Sargon the Great, King of Sumer and Akkad. Sargon I "The Great", King of Sumer and Akkad ca. 2334-2279 b.c. Sargon is one of the best candidates of all the human kings for being the mysterious Nimrod. 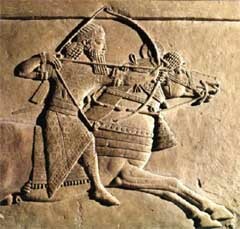 Though Gilgamesh best describes Nimrod in his aspect of mighty hunter, mighty warrior, and ruler of Sumer, later Sumerian, Akkadian, Babylonian and even Assyrian kings better fulfill the description of Nimrod as a conqueror. And of all of the kings of Sumer, Sargon was the first to become a true conqueror, conquering all of the city-states of Sumer and Akkad and creating the first true empire. The Sumerian king list gives a number of kings whom it claims ruled for thousands of years, and then ends just before Sargon. Sargon then takes the stage in the 23rd century b.c., defeating Lugalzaggisi, the king of Uruk, and dragging him away in a dog collar in order to humiliate his former master and literally bring him to heel. This sort of radical action, intended to strengthen his own image as a mighty conqueror who is not to be trifled with, seems unusually cruel and disrespectful even for a conquering king. The brothers of my father loved the hills. Not of royal Sumerian blood, Sargon was actually a Semite, of the Akkadians who were the neighbors of the Sumerians to the north. His mother is described as a "changeling", a term which in English means that she, or perhaps Sargon himself, or both, had been placed in their mother's wombs by divine parents. Thus, by including this term, Sargon was ascribing to himself divine parentage, making himself, like Gilgamesh before him, a mighty man and son of the gods. Sargon's description of himself as having been set upon the water in a reed basket is also interesting, as the description of his watery journey is very similar to the early experience of Moses. Though the two men are clearly different, separated by thousands of miles and at least a thousand years, this description has incited no small amount of speculation on its own. Raised by a poor "drawer of water", Sargon was then granted good fortune by Ishtar, whom he believed placed him in the right place at the right time to ascend to kingship. "Sargon began his career as cup-bearer to Ur-zababa, king of the city of Kish. A Sumerian-language version of the story tells that Sargon escaped assassination. He somehow became king himself and expanded his rule all over southern Mesopotamia, pushing north to conquer Mari, Ebla, Ashur and Nineveh and even reaching Anatolia and the Mediterranean. At some point Sargon moved his capital to the previously unknown city of Akkad, adding the title "King of Sumer and Akkad" to his previous designation, "King of Kish".29 He then adopted the titleSharru-kin, "the true king", apparently feeling that it was necessary to take steps to strengthen his legitimacy. This would make sense, as not only had he usurped the previous king of Sumer, he was not even Sumerian, instead being of Akkadian lineage. Also, by keeping the appellation "King of Kish" throughout his reign, he further helped legitimize his accession to the throne, as Kish, as we have seen, was the place where kingship had been brought down from heaven after the Flood. Where the Sargon solution fails, however, is the description of Nimrod's building of the cities of Nineveh, Resen, and Calah in Assyria. Though Sargon did indeed conquer and control that entire region, there is no description anywhere that he built these cities, one of which, Nineveh, had been inhabited well before his time, at least as far back as 6000 b.c. He was also nowhere described as "a mighty hunter", being instead more of a sophisticated politician and imperialist, focused on hunting for personal power rather than for men or animals. So, whereas Sargon is the best solution for a human king, there are still some questions that need to be answered before we can make a final judgment regarding the true identity of the mysterious Nimrod. 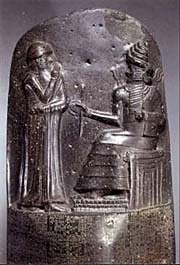 Amraphel, or "Hammurabi", receivingThe Code of Hammurabi" from the Sumerian god Shamash. The Code of Hammurabi is the first known comprehensive set of laws that regulated everyday life down to unprecedented detail, preceding even the 10 Commandments. Amraphel was the name of the king of Babylon during the time of Abraham, ca. 2000 b.c. Scholars generally believe him to beHammurabi. Amraphel, according to the text, was part of a coalition of kings that had been put together by one Chedorlaomer, king of Elam, who at that time apparently held suzerainty over Babylon. As we discussed inPart I of our "Giants in the Earth" series, these kings banded together in order to defeat the Amorite giants of Canaan, who had failed to pay tribute to Chedorlaomer. 2100-2000 b.c. is a good time for the building of the tower, as it was during that time that a disaster had struck Sumer, destroying the old order forever, as described in the "Lamentation over the Destruction of Ur. "31 However, Amraphel is not a good candidate for Nimrod, as he not only never founded any cities to our knowledge, but only had nominal control over Babylon as Chedorlaomer's vassal. Nevertheless, a great deal of speculation on the identity of Nimrod involves Amraphel. Interestingly, according to the Midrash, Nimrod had originally been warned of the birth of a man who would defeat him by the appearance of a special star in heaven. As a result, he murdered all the newborns, and forbade marriage, and men had to abstain from sexual relations with women for a long time, to make sure that no babies were born during the time of the star's appearance. Abraham's father Terah managed to impregnate his wife anyway, and Abraham, according to the legend, was raised in secret. This pattern of destruction of newborn babies who might be a threat to the established order is one of the recurring themes in the Bible. Assisting Tikulti-Ninurta's claim to Nimrod fame are the facts that he was of the Cassite tribe (who may have descended from Cush, as had Nimrod), the fact that he was a mighty warrior, and the fact that he was a great builder of cities in Assyria. However, Tikulti-Ninurta did not start his kingdom in Sumer, as had Nimrod, but in Assyria, later adding Sumer to his domain. Moreover, he did not build Nineveh to be sure, merely maintaining it. Ninus, also known as Shamshi-Adad, King of Assyria, ruled around ca. 800 b.c. He was the eponymous founder of Nineveh, and as such is suggested by some as the true Nimrod. However, Ninus could only have renamed Nineveh, as that great city had been occupied for thousands of years previous to his reign. Ninus came onto the world stage far too late in the game, was not known throughout the ancient world as "a mighty hunter" or "mighty warrior", and did not begin his kingdom in Shinar. However, he may have been an important link in a chain that has lasted for millennia, a chain of rulers whose secret may lead us to the true nature of the mysterious Nimrod. Orion, the mighty hunter. Before he was set in the stars as a constellation, Orion was a titan, one of the giants of the antediluvian world who had been defeated by the Olympian gods and destroyed by the Flood sent by Zeus. Orion was a mighty hunter and, as depicted in the constellation, appears to be opposing the onrushing bull Taurus. The bull Taurus may be symbolic of God, whom Orion, like Nimrod, opposed and fought against. Thus, the true identity of Nimrod may have been written in the stars all along. Images compiled from E.W. Bullinger, The Witness of the Stars (Grand Rapids:Kregel Publications, 1967), 125. All rights reserved. Click here for a larger version. Orion was a titan, a giant literally four times the size of a normal man, according to some accounts. He was also a mighty hunter who was able to manifest supernatural powers, and was famous all over the ancient world, including Mesopotamia. Regarding his constellation, Bullinger explains, that Orion "is so pictured in the ancient Denderah Zodiac, where we see a man coming forth pointing to the three bright stars (Rigel, Bellatrix, and Betelguez) as his. His name is given as Ha-ga-t, which means this is he who triumphs. The hieroglyphic characters below read Oar. Orion was anciently spelled Oarion, from the Hebrew root [or] which means light. So that Orion means coming forth as light. The ancient Akkadian was Ur-ana, the light of heaven.35 This description fits well with one of the translations of the name "Gilgamesh" — Namra Udu, "shining light", which is where the name "Nimrod" may have derived. It may also be instructive to note that the names of Uruk and Ur, two of the major cities of Mesopotamia over which Nimrod ruled, also contain the word ur, "light", as part of their names. So, not only was Orion a mighty hunter, he was also a gibbor, or mighty warrior. Moreover, the constellation is arranged in the sky in such a way that it appears to be opposing the onrushing bull, the constellation of Taurus. The bull Taurus may be symbolic of God, whom Orion, like Nimrod, opposed and fought against. Thus, the true identity of Nimrod may have been written in the stars all along, where Orion, mighty hunter "before" the Lord could be translated as "in front of", "opposing", or "against" in the sense that Orion is opposing God, rather than somehow working for him. In the same way, the term "antichrist" can mean either "in place of Christ" or "against Christ" — one meaning is merely questionable, whereas the other is clearly more sinister. And since the Hebrew etymology of the word "Nimrod" is actually "we shall rebel", then the sinister "Mighty hunter against the Lord" should become the accepted translation. Now that we have established that Orion fulfills the description of both "mighty warrior" and "mighty hunter against the Lord", the question remains, how can a constellation begin his kingdom in Shinar, or build cities in Assyria? The key to understanding how Orion answers the Nimrod puzzle so completely is the fact that though Orion did not actually build the cities, those who did rule Shinar and who had built Assyria all worshiped and were inspired by the divine constellation of Orion. And though they had used different names for the constellation, such as Ninurta and Marduk, Orion being a later Greek appelation for the same constellation, in their minds the same constellation ruled the heavens above and the Earth beneath. In that way, though there were many different earthly "Nimrods" who had hunted and warred and built, there was but one heavenly Nimrod that ruled the heaven and Earth, unchanging, for thousands of years. Bottom: An illustration of the pillars, with the constellation of Orion as it would appear to an observer looking south. Images from Adrian Gilbert,Magi: The Quest for a Secret Tradition(London: Bloomsbury Publishing Plc, 1996), 203-204. Interestingly, the enthronment of Nimrod appears to be linked with two pillars. Perhaps this is similar to the experience of Samson, a judge of Israel from the tribe of Dan, who was also like Nimrod, being a mighty hunter, warrior, and who also had great strength and supernatural abilities. Samson appeared "between the pillars" of the Philistine temple of Dagon, destroying the Philistines by pushing down those two pillars, which had been critical supports for the temple. Interestingly, like Orion of the Greek myths, Samson had also been blinded by his enemies after having shown inappropriate interest in a woman. Moreover, the lost tribe of Dan is believed by some to be the tribe that would produce the antichrist, and Nimrod is generally believed to be a type of the antichrist. And since by the time of Samson Israel had begun to ignore God's prohibition against intermarrying with the Canaanites, and since the tribe of Dan was the first and most flagrant violator of that law, it is likely that Samson had had one or more giants in his family tree — giants that may have descended from the line of giants that Osiris had founded in Mesopotamia thousands of years previously. And Osiris, as we have seen, also was portrayed by the Egyptians as the constellation of Orion. Thus, the clear linkage between Nimrod, Orion, Samson, and Osiris may be the final clues to the true identity of the mysterious Nimrod: Osiris. Osiris, the namesake of the Osirian civilization that Nimrod was attempting to rebuild. Osiris is represented by the constellation of Orion in Egyptian zodiacs, and may have been the same man as the legendary Nimrod of Mesopotamia known as a great hunter, conqueror, and builder of cities. Finally, we reach the true source of the Nimrod legend: Osiris, king of Egypt. Osiris, as we saw in Part I, was a mighty man of old — a demigod, a giant, a king, a conqueror, and a great civilizer and builder of cities. Furthermore he, like Nimrod, was greatly interested in recovering information from the world before the Flood. And, perhaps most importantly, after he had civilized Egypt, Osiris traveled to other lands, leaving Isis as his regent, to teach other peoples what he taught the Egyptians. This is the key — in ancient times Osiris, traveling throughout the ancient world attempting to civilize mankind, had left behind mighty legends in his wake of a physical, intellectual and spiritual giant of a man who had, in ancient times past, traveled to Mesopotamia and civilized the barbarians that had lived there. Forever afterwards, they looked back to this "Golden Age" when demigods walked the Earth, teaching mankind the arts and sciences and civilization. Izdubar/Gilgamesh may have in fact been Osiris, as the pronunciation of Osiris' name from the original hieroglyphics is actually pronounced "whizzer", very close to "Izdubar". It is also not a surprise that the first king of united Egypt was named "Nar-mer", one of the god-names of Horus, which is also very similar to Nimrod. The symbol of Narmer was that of a catfish surmounting a chisel. Though this symbol seems curious at first, it may be an important clue to the origin of Osiris and an ancient line of divine kings who claimed descent from him. There is a family in Europe named the Merovingians who have descended from a 5th-century king who claimed to have been the offspring of a human mother and a mysterious "beast from the sea": "the mysterious sea beast — the Bistea Neptunis — as symbolically defined in the Merovingian ancestry. The relevant sea-lord was King Pallas, a god of old Arcadia.... The immortal sea-lord was said to be 'ever-incarnate in a dynasty of ancient kings' whose symbol was a fish. "40 Thus, the Egyptian hieroglyphics for catfish and chisel that make up Narmer's name may refer to the fact that Narmer was of divine parentage, and the chisel may refer to the fact that he was known as a cutter of stone and, therefore, a builder of cities. Thus, like Nimrod, Narmer was a semi-divine king known for building cities. This makes sense, as Narmer was the king that had unified upper and lower Egypt around 3200 b.c., forming the first nation of the ancient world. Though probably not the king who inspired the legend of Osiris, Narmer was almost certainly of the divine lineage of Osiris, and may well have been the source of the name "Nimrod". The constellation or Orion. Inset is a closeup of the three belt stars of Orion, with a line drawn through them to show how they are aligned. 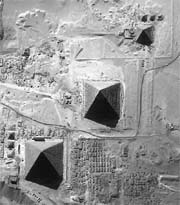 An aerial view of the Pyramids of Giza, which some believe were meant to be an earthly mirror to the belt stars of Orion in heaven. From bottom left to top right: "Great" Pyramid of Khufu, Pyramid of Khafre, Pyramid of Menkaure. The three main pyramids of Giza, which mirror exactly the three belt stars in the constellation Orion. Bauval, Hancock and others believe that this was an attempt by the ancient Egyptians to create a "heaven on earth" in a very real sense. The three cities of Assyria built by Orion/Nimrod, which may also mirror the belt stars of Orion on Earth. It may well be that Nimrod did not start out in Sumer at all, but in Egypt, where he was known as Osiris. Thus, though Nimrod's kingdom appears in the Bible to have been restricted to Mesopotamia (modern Iraq), this is unlikely as Cush, his ancestor, was the father of the Kushites, who lived in what is now Ethiopia, south of Egypt. Similarly, Mizraim, Cush's brother, was the father of the Egyptians (miz rai'm is the Hebrew name for Egypt - literally, "the two lands", referring to upper and lower Egypt). It is also instructive to note that the Bible said that the beginning of Nimrod's kingdom was Babylon, indicating that he may have spread outward from Mesopotamia, spreading out throughout the ancient Mediterranean world building magnificent structures the likes of which cannot be duplicated even today. And though Nimrod is best remembered by his feats of strength and building of architectural marvels, further study will be required to see what became of his most important legacy to mankind: the line of divine kings that followed after him. Osiris answers all of the questions that have been nagging commentators for millennia, especially the reference to Nimrod being a descendant of Cush. The Cushites lived in Ethiopia, southern Egypt, northeast Africa and southern Arabia, and some of their descendants may well have emigrated north and east into the land of Shinar. There, they began to rebuild the antediluvian cities of the plain that had been destroyed by the Flood, and then began expanding outwards in their attempt to rebuild and recivilize the Earth as it had been. Osiris is at the right place, at the right time, and of the right lineage to be the fabled Nimrod of old. And forever after, his great exploits were remembered by the ancient Mesopotamians in their myths and legends, and in the stars. It appears that we are at the end of the chase, and have captured the legendary Nimrod. Osiris, the namesake of this series, was the great civilizer of mankind in and around the Mediterranean region that had been drowned by the Flood. And though it appears that his attempt to rebuild the world before the Flood failed, the great empires of the ancient world fading away and being forgotten, now covered over by a thick and nearly impenetrable layer of Islam, it would be premature to say that Osiris has failed in his attempt to recreate the world before the Flood. The answer to the identity of Nimrod does not lay entirely in the personage of Osiris, or in the constellation of Orion, which remembers him. The third leg in the triune identity of Nimrod is the legacy of kings that he left behind him — kings that claimed that the royal blood of Nimrod flowed in their veins, giving them the divine right of rulership over mankind. And this line of kings may not be broken; some believe that one of this line may arise in the end to reconquer the land of Shinar, in a quest to conquer the world and restore the world to the way it had been before the Flood, when semi-divine kings ruled over a world enslaved. At that time a Nimrod will arise and believe himself to be wise — but in the end, he will be shown to be only a prince of fools. 1 A. Leo Oppenheim, trans, "The Sumerian King List" in James B. Pritchard, ed.,Ancient Near Eastern Texts Relating to the Old Testament with Supplement(Princeton, NJ: Princeton University Press, 1974), 265-266. 2 J.B. Tannehill, Naamah and Nimrod: A Defense of the Faith of our Fathers(Columbus, OH: The New Franklin Printing Co., 1916), 314. (Winona Lake, IN: Eisenbrauns, Dec. 1994). 4 Tannehill, Naamah and Nimrod, 86-87. 5 P. Ant. Deimel, "Shumer = Shinar" Biblica 2 (1921), 71-74. 6 A.S. Yahuda, "Calneh in Shinar" Journal of Biblical Literature 65 (1946), 325-327. 7 K. van der Toorn and P.W. van der Horst, "Nimrod before and after the Bible"Harvard Theological Review 83:1 (1990), 1-2. 8 "Book 2: Parables (Chap. 69)" in The Book of Enoch, translated from the Ethiopian by R.H. Charles. (Academy for Ancient Texts: http://www.ancienttexts.org). 9 "The Sumerians and the Akkadians" in The Encyclopedia of World History, ed. Peter N. Stearns (Bartleby.com: http://www.bartleby.com). 10 Victor P. Hamilton, The New International Commentary on the Old Testament: The Book of Genesis: Chapters 1-17 (Grand Rapids: Eerdmans, Dec. 1994), 339-340. 11 Gordon J. Wenham, Word Biblical Commentary: Genesis 1-15 (Waco, TX: Word, 1987), 224. 12 "Calah" in The International Standard Bible Encyclopedia, ed. James Orr (Studylight.org: http://www.studylight.org). 13 van der Toorn, "Nimrod before and after the Bible", 6. 14 "Resen" in The International Standard Bible Encyclopedia, ed. James Orr (Studylight.org: http://www.studylight.org). 15 "Resen" in The International Standard Bible Encyclopedia, ed. James Orr (Studylight.org: http://www.studylight.org). 16 Emil G. Hirsch, M. Seligsohn, Wilhelm Bacher, "Nimrod" in The Jewish Encyclopedia, ed. James Orr (JewishEncyclopedia.com:http://www.jewishencyclopedia.com). 17 Hirsch, Seligsohn, Bacher, "Nimrod" in The Jewish Encyclopedia. 18 "Nimrod (king)" (Wikipedia, The Free Encyclopedia: http://www.wikipedia.org). 19 Hirsch, Seligsohn, Bacher, "Nimrod" in The Jewish Encyclopedia. 20 van der Toorn, "Nimrod before and after the Bible", 6. 21 van der Toorn, "Nimrod before and after the Bible", 10-11. 22 van der Toorn, "Nimrod before and after the Bible", 15. 23 Hirsch, Seligsohn, Bacher, "Nimrod" in The Jewish Encyclopedia. 24 van der Toorn, "Nimrod before and after the Bible", 10. 25 Oppenheim, "The Sumerian King List", 265-266. 26 Hirsch, Seligsohn, Bacher, "The Epic of Gilgamesh" (Academy for Ancient Texts:http://www.ancienttexts.org). 27 George Smith, The Chaldean Account of Genesis (New York: Charles Scribner's Sons, 1986), 184, 191. 28 Robert A. Guisepi and F. Roy Williams, "The Legend of Sargon" (The International History Project: http://ragz-international.com). 29 Yigal Levin, "Nimrod the Mighty, King of Kish, King of Sumer and Akkad" Vetus Testamentum 52:3 (2002), 360. 30 Hirsch, Seligsohn, Bacher, "Nimrod" in The Jewish Encyclopedia. 31 Samuel Noah Kramer, trans, "Lamentation over the Destruction of Ur" in James B. Pritchard, ed., Ancient Near Eastern Texts Relating to the Old Testament with Supplement (Princeton, NJ: Princeton University Press, 1974), 455-463. 32 E. A. Speiser, "In Search of Nimrod" Eretz Israel 5 (1958), 34. 33 E.W. Bullinger, The Witness of the Stars (Grand Rapids: Kregel, 1967), 9-10. 34 "Orion" (Mythology Guide: http://www.online-mythology.com). 35 Bullinger, The Witness of the Stars, 125. 36 van der Toorn, "Nimrod before and after the Bible", 11. 37 S. Vailhe, "Edessa" in The Catholic Encyclopedia Online (The Catholic Encyclopedia Online: www.newadvent.org/cathen/). 38 Adrian Gilbert, Magi: The Quest for a Secret Tradition (London: Bloomsbury Publishing Plc, 1996), 209. 39 Gilbert, Magi: The Quest for a Secret Tradition, 207. 40 "THE MEROVINGIAN DYNASTY: Bloodline of Jesus or Synagogue of Satan?" (Watch Unto Prayer: http://watch.pair.com). 41 John Anthony West, Serpent in the Sky: The High Wisdom of Ancient Egypt(Wheaton, IL: Quest Books, 1993), 1. 42 David Hatcher Childress, Lost Cities and Ancient Mysteries of Africa & Arabia(Kempton, IL: Adventures Unlimited Press, 1997), 25-26.